… and taking public comments on potential impacts of upzoning and adding density and growth to our community. 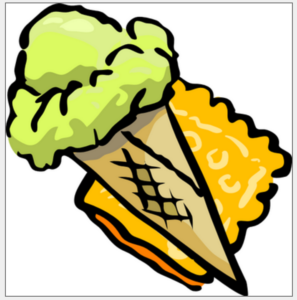 Free Ice Cream: Staff from the City will take comments on the potential impacts of adding density and growth in Crown Hill Urban Village this Saturday, August 27th during Seattle Summer Parkways on Ballard Avenue at 22nd NW in the Ballard Historic District. Look for a booth called CityScoop where City staff will be available to talk about specific impacts of Upzoning in Crown Hill Urban Village and giving out free ice cream from 1-3pm. Re-Zoning Framework Passed: The full City Council unanimously passed the Mayor’s Mandatory Housing Affordability (MHA) Framework Law on August 15, which puts the policy framework in place to upzone within Urban Villages and to make buildings larger and taller. The actual zoning changes and mapping have not been implemented and will not be decided until 2017. Here in Crown Hill Urban Village, we still have an opportunity to influence the zoning and implementation of density and growth, and we need everyone’s voices to impact the trajectory of growth in our community. Take Action: One of the first steps to influence how Crown Hill Urban Village adds density is to make sure that our concerns are included in the Scope of the Environmental Impact Statement (EIS). The Crown Hill Urban Village Committee for Smart Growth has submitted detailed comments to the City regarding issues that have surfaced in the 517 thoughtful comments submitted by YOU when 575 of you filled out our survey and through community meetings and online comments. Thank you for your tremendous engagement on the issue of growth. Please use this comment card to send your ideas to the City for the Environmental Impact Statement. You can download the card here. We hope you will join us and ask the City to evaluate and mitigate the impacts of growth and upzoning on basic neighborhood infrastructure (utilities, transit, open space, schools, pedestrian safety, etc) and its impact on all neighbors – renters, owners, businesses and landlords – by telling the City your specific concerns or impacts that need to be addressed before Crown Hill Urban Village is rezoned and grows. Return the City’s short comment card by mail, or scan and email it to Geoffrey.Wentlandt@seattle.gov by September 9th, or stop by the CityScoops booth this Saturday at Seattle Summer Parkways. 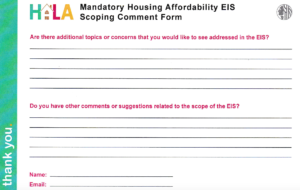 The Next Level: Please consider sending your comments to Councilmember Rob Johnson’s, Chair of the Planning Land Use and Zoning committee c/o amy.gore@seattle.gov. The City Council will hold a Public Hearing on the Seattle 2035 Comprehensive Plan on Thursday, September 15th at 2:00 at City Hall. Written comments are welcome in advance on this critical legislation that will impact our neighborhood’s future. I’m writing regarding Seattle’s Comprehensive Plan, Seattle 2035, and its potential impact on my neighborhood, Crown Hill Urban Village. Please support provisions in Seattle’s Comprehensive Plan that will provide meaningful planning before rezoning, upzoning or expanding Crown Hill Urban Village. And please tie needed infrastructure and transit improvements to growth so we all enjoy a livable community. As always, please remember that thoughtful and polite comments are the most effective and impactful advocacy.